When they say that “some people handle alcohol better than others”, it doesn’t just apply to getting drunk after drinking just one or two glasses. It also applies to the severity of hangover the next morning. It’s not unusual to experience nasty hangover symptoms like headaches and nausea. However, you’re smart enough to understand that drugs like aspirin and acetaminophen won’t get you very far. What you need is a powerful and proven hangover remedy and say goodbye to the nasty hangover symptoms. drinkSmart Hangover Supplement is a hangover remedy that claims to do wonders for your hangover. It claims to eliminate hangover, protect your liver from alcohol-induced damage, and promote good liver health. But are these claims true? Is this just a marketing gimmick to entice people into buying their product? Does it live up to the hype? Well, we are about to find out. In this drinkSmart review, we are going to look into every important aspect of the Hangover Supplement.This includes the manufacturer, the ingredients used to make it, its potential side effects, and pricing. drinkSmart is the maker of drinkSmart Hangover Supplement. It’s a fairly new company that is also responsible for another hangover supplement referred to as Hi-Lyte. According to the manufacturer, their hangover remedy was developed by a Harvard trained researcher and Medical Doctor. This was after years of thorough research, and updated based on the latest science in the year 2017. The hangover remedy is specially designed for healthy social drinkers. It contains a blend of natural, organic ingredients and antioxidants. These ingredients work together to counteract the negative effects of alcohol in your body. This will allow you to wake up fresh, energized, hangover-free, and ready to grind the day. drinkSmart is also designed to promote the health and function of your liver. As a result, it’s able to handle alcohol much more effectively. It means that drinkSmart Hangover Supplement will help eliminate your hangovers and any negative effects of alcohol. It will also reduce your risk of developing alcohol-related liver complications. We don’t want to take the manufacturer’s word for these claims. We need to verify if these claims actually true. And what better way to do so than evaluate the main active ingredients in this supplement? It’s the only way to find out whether it can live up to the hype or not. When choosing a hangover supplement, it’s advisable first check the ingredients that have been used to create it. Because choosing a supplement that uses effective and proven ingredients is a guarantee that you will actually see real results. We love the fact that drinkSmart pills contain all-natural organic ingredients. The good thing about natural ingredients is that they have lesser side-effects (if any). drinkSmart Hangover Supplement uses a proprietary blend. We are still trying to understand why this manufacturer decided to use a proprietary blend. It common knowledge that proprietary blends are the biggest lies in the supplements industry. The weirdest thing about proprietary blends is that there is no telling the actual doses of ingredients in a product. This means that you have no idea how much strength is in these ingredients. This of course makes it difficult for you to determine the effectiveness of the supplement. Honestly, there is no excuse for the manufacturer to use a proprietary blend. It’s a little bit shady and we have to be honest with you on this. drinkSmart is certainly not the best hangover remedy in the market because of this. We have better hangover supplements that do not use proprietary blends. That said, let’s have a look at the main active ingredients that make up drinkSmart Hangover Supplement. The ingredients in this hangover cure are divided into three sections. First, we are going to look at the ingredients comprising its Detox & Recovery Blend. Dihydromyricitin is a common ingredient in numerous anti-hangover medicines. It’s a Chinese herb extract derived from the Hovenia Dulcis Raisin tree. The herb has been used as a natural hangover remedy in China and other Asian cultures for centuries. In drinkSmart, the extract treats your hangover in a number of ways. One, it blocks alcohol intoxication. Two, it enhances the activity of Alcohol dehydrogenase, the enzyme that breaks down the hangover-inducing acetaldehyde. And three, it inhibits the action of GABA receptors in the brain to reduce common signs of drunkenness. Dihydromyricitin also supports the function and health of your liver. As a result, it’s able to excrete alcohol byproducts and toxins. Dihydromyricitin is without a doubt an excellent inclusion in this hangover remedy. But we would be happy to see its actual quantity in the ingredients label. Reishi Mushroom is often regarded as the “Queen of Medicinal Mushrooms.” This is due to its ability to treat numerous diseases and boost immunity. The mushroom is also a powerful antioxidant, detoxifier, and has mild tranquilizing effects on the central nervous system. In one study, reishi decreased the prevalence of inhibitory neurotransmitters that are characteristics of alcohol consumption. Since it has been used in ancient medicine, it makes a great addition in this hangover remedy. Still, we don’t know how much of it is in this supplement. Taurine and Theanine are the calming ingredients in drinkSmart Hangover remedy. They work by promoting calming neurotransmitters like dopamine, serotonin, and GABA. This means that upon taking a few tablets, you should be able to sleep well. Additionally, you will feel less anxious, and of course wake up stress-free. We applaud drinkSmart for including these two calming ingredients. It can help calm the nerves and get rid of your hangover. The herb is a powerhouse of phytochemicals and nutrients. These help promote liver health while enhancing its toxins removal ability. It is also known to help treat alcohol-related diseases. Alongside Milk Thistle are two of the most popular hangover ingredients- NAC and Alpha Lipoic Acid. The aim is to boost liver detoxification and speed up recovery of alcohol-related liver diseases. It’s definitely another great addition to this herbal supplement. This blend consists of Ginger Extract, Goji Berry Extract, Green Tea Extract, Schisandra Extract, Organic Cucumin, and Rhodiola Rosea Extract. The above ingredients make up drinkSmart’s Antioxidant Superfood Renewal Complex Blend. Because of their high antioxidant content, these ingredients help eliminate harmful free radicals and support your immune system. Their inclusion is great, although their exact amount is not included in the ingredients label. During metabolization of alcohol, a lot of vitamins and minerals are depleted. This explains why excessive alcohol consumption leads to vitamin and mineral deficiencies. Loss of nutrients due to alcohol consumption also causes the immune system to become weak. drinkSmart knows this too well. This is why their hangover remedy is chock-full of essential vitamins like E, C, B, and minerals. These help replenish and replace the lost nutrients. Vitamins C and E are powerhouses of antioxidants that help fight damaging free radicals. They also boost your immune system. The minerals in this supplement aid in all the metabolic processes of the liver while improving its overall health. 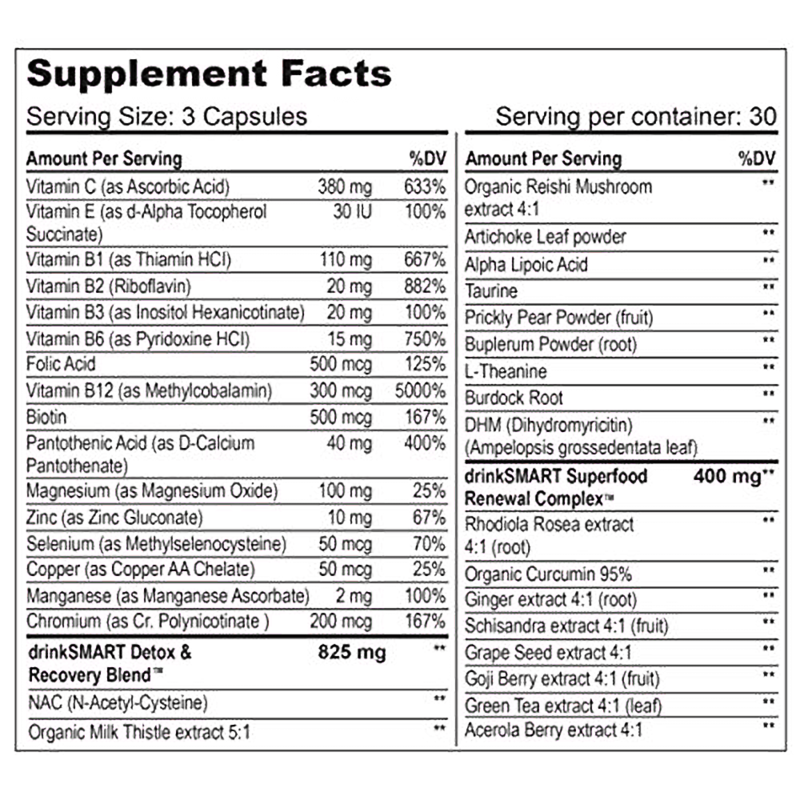 drinkSmart has included the specific amount of Vitamins and Mineral doses. This was a good move, though this little difference isn’t enough to make up for the proprietary blend. Sadly, it’s not. drinkSmart contains absolutely every ingredient under the sun in this hangover remedy. To be exact, it contains a whopping 35 ingredients. This means they have used small doses for each one of these ingredients. It’s plain to see that drinkSmart spread themselves too thin. It would have been much better if they used a few powerful ingredients in larger doses than 35 with tiny doses. We have to be honest with you here. drinkSmart doesn’t seem like the kind of hangover remedy worth spending money on. In fact, their “Bye Bye Hangover” marketing slogan doesn’t match their hangover formula. drinkSmart Hangover Supplement- Any Side-Effects? It’s quite normal to be skeptical about the safety any hangover cure supplement. With the market saturated with numerous fake products, one can never be too careful. drinkSmart remedy has helped some people eliminate their hangovers. However, some have complained about feeling sick right after taking the hangover capsules. However, it’s hard to tell if this was because of the capsules. Some have complained of stomach aches. 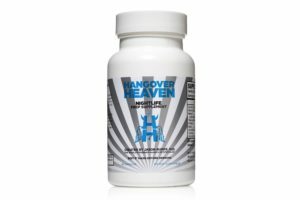 · Their marketing on their official website and Amazon says- “Bye Bye Hangovers.” This is to suggest that these tablets will completely cure hangovers, which is unlikely. · Their recommended dosage is to take it on a daily basis. Most people don’t normally drink on a daily basis and even if some do, it’s not advisable. It’s either a product for alleviating hangover symptoms- or it’s not. Furthermore, it’s marketing itself as a hangover remedy and a product to boost liver health. Maybe they should be a little bit clearer on this one to avoid confusion. · They try to sell the fact that a medical doctor made this hangover remedy from scratch. Quoting studies would have been preferable. 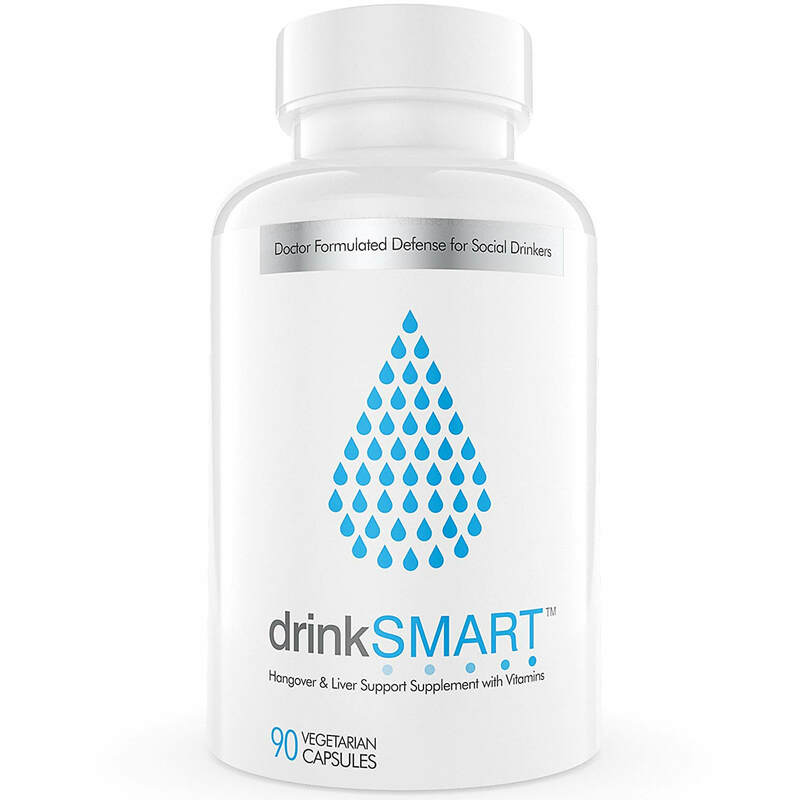 drinkSmart hangover remedy is currently on sale at $37.95 on Amazon for a bottle with 30 vegetarian capsules. You can also purchase it via the manufacturer’s official website at $49.95 for a bottle with 90 vegetarian capsules. However, you will notice that the price for a 30 capsules bottle on their website is higher than the 90 capsules bottle on Amazon. Can you see the difference? You’re buying 30 capsules for $37.95 on their official website while on Amazon, you’re buying 90 capsules for $49.95. There is no denying that hangovers can wreck your entire day and even cause you to miss work. But with the right hangover supplement, you should be able to go to work the next morning without a nagging hangover. drinkSmart has done a great job including some of the most popular anti-hangover ingredients. Also, the fact that the ingredients are all-natural and organic is a big plus. However, using a proprietary blend wasn’t very smart. Everyone knows that proprietary blends are just a trick that many manufacturers use to avoid disclosing the actual doses of ingredients. In conclusion, drinkSmart Hangover Supplement isn’t a bad hangover remedy. We have clearly pointed out a few positives. However, it’s certainly not the best hangover remedy in the market.